What Day Of The Week Was October 31, 1968? 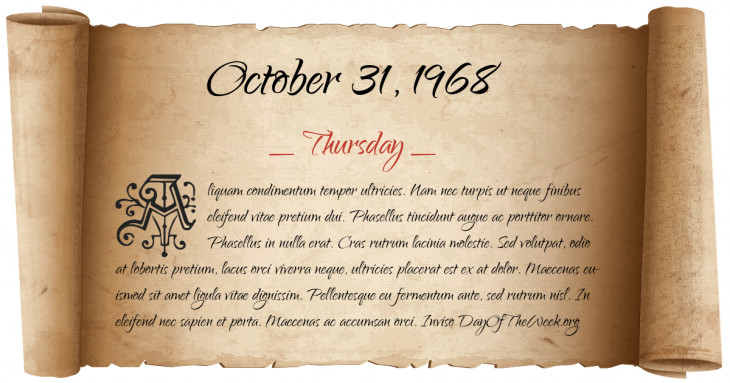 October 31, 1968 was the 305th day of the year 1968 in the Gregorian calendar. There were 61 days remaining until the end of the year. The day of the week was Thursday. A person born on this day will be 50 years old today. If that same person saved a Half dollar every day starting at age 5, then by now that person has accumulated $8,304.50 today. Here’s the October 1968 calendar. You can also browse the full year monthly 1968 calendar. Monkey is the mythical animal and Earth is the element for a person born on this day if we consider the very old art of Chinese astrology (or Chinese zodiac). Vietnam War October surprise: Citing progress with the Paris peace talks, US President Lyndon B. Johnson announces to the nation that he has ordered a complete cessation of “all air, naval, and artillery bombardment of North Vietnam” effective November 1.
Who was born on October 31, 1968?